Fallen Fire Fighter Memorial service in Colorado Springs, Colorado. In a somber and moving ceremony the lives of Sara Thomas, Julie Freeman and Cory Iverson were remembered for their dedication to family, friends and public service. To view more pictures of the ceremony, click here. Open Enrollment starts September 10 and ends October 5. If you aren't making changes to your coverage, no action is needed. This is another opportunity to update your dependents! Check out their newsletter for more info. Additional resources and things you need to know can be found here. This very special program is built to provide the world's finest golf equipment to the world's finest people - the men and women of the Army, Navy, Air Force, Marines, Coast Guard and our nation's Law Enforcement, Firefighters, and EMT's. To recognize those who are currently serving or have served, PXG founder, Bob Parsons, a U.S. Marine Corps Vietnam veteran, is providing special pricing on PXG 0311 GEN1 Irons (starting at $125 per club) and Wedges, many of PXG's 0811X driver line, 0341 Fairway Woods, 0317 Hybrids, Putters, and, for a limited time, PXG 0311 SGI GEN2 Irons! Click here to view the names that will be added to the wall. 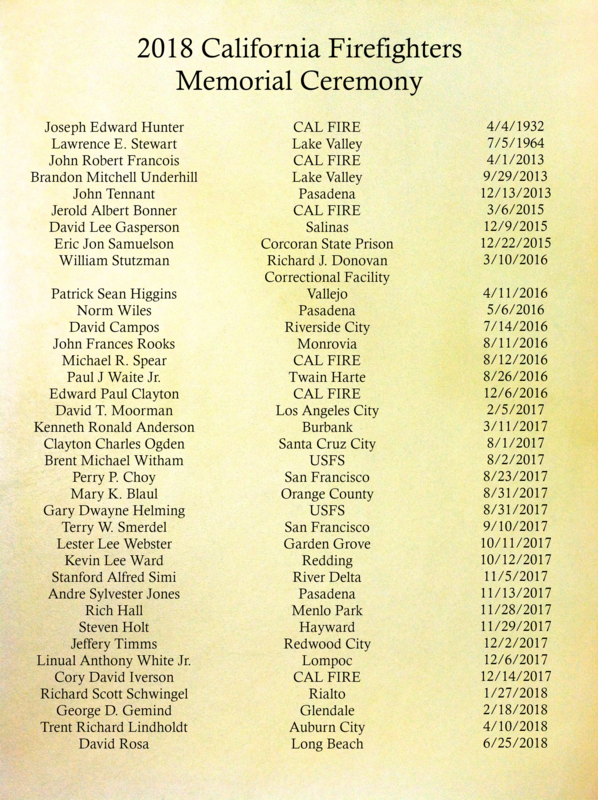 The enactment of the landmark Firefighters Bill of Rights gives California firefighters the fairest, most extensive privacy protection enjoyed by any public employee in the state. Preserving appeal rights. Appeals process must conform to state Administrative Procedures Act. In the past 40 years, regular working Americans have barely seen their salaries grow, while around them, the cost of housing and basic needs have skyrocketed, as has pay for business executives. What's behind this decline? Economists and political scientists often point to the decline of labor unions in those same years as a major contributing factor to the current environment of soaring business profits and meager worker salaries. When unions were at their strongest before the 1960s, they helped narrow the gulf between worker and executive pay (which currently stands at 312 to 1), and lobbied for higher minimum wages and better access to health care. Researchers have also speculated that unions created positive spillover effects at nonunionized workplaces, where managers may have introduced higher salaries and better benefits in an effort to head off organizing efforts among workers. The autonomic nervous system (ANS) consists of two divisions: the sympathetic (fight and flight) and the para-sympathetic (rest and digest or feed and breed). The issue is that both portions of the ANS feed input into the body's other systems. Having appropriate input of these systems allows for balance and homeostasis within the body. Heart rate, blood pressure, dilation of the pupils and even bowel movements are under the control of the ANS. Have you ever felt like you were going to lose control of your bowels during a period of intense stress? You can thank sympathetic nervous system override. In his book "Why Zebras Don't Get Ulcers," author Robert Sapolsky addresses stressors on the human body. 1 Briefly, there are acute stressors and chronic stressors. Unfortunately, as humans, we tend to take what should be an acute stress ("that jerk just cut me off in traffic and I almost wrecked my car!") to a state of chronic stress (stomach in knots about that same jerk a week later). Zebras, on the other hand, just do their zebra things. They avoid the jackals and lions as necessary and don't dwell on it after. They also don't stress about buying a nicer house. LINCOLN, Neb. - A firefighter-paramedic opened up about his struggle with mental health during National Suicide Prevention Week.